Cull of 30,000 pet dogs ordered after deadly rabies outbreak in Chinese City. Dogs in Jiangmen to be seized and put down to improve sanitation but experts brand plan unscientific and inhumane. A southern Chinese city has banned pet dogs, leaving tens of thousands facing a cull unless they can find new homes. Authorities in Jiangmen, August will be seized or killed, city officials say. 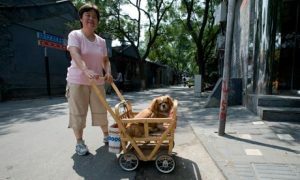 Guard dogs will be allowed, but only for companies with property worth at least 5m yuan (£474,000). The Jiangmen Daily said officials aimed to “prevent and control rabies, maintain public order and sanitation, and create a sound environment for the people”. The newspaper added that 42 of the city’s 4 million residents had died from rabies in the past three years. “Dogs found with diseases will be euthanised in a humanitarian manner. We will sign agreements with owners before putting down their dogs,”Li Wantong, technology director at an animal disease control centre in Jiangmen, told the there is growing interest in animal rights, particularly among the middle class. He added that a vaccination programme for dogs would be cheaper and more effective. China has the world’s second-highest death toll from rabies after India, with cases rising sharply in the past decade, possibly due to increasing pet ownership and rising healthcare costs. The health ministry says 3,300 people died of the disease in 2007, although the toll fell to 2,466 in 2008 and experts believe the worst may be over. In several cases tightened dog ownership rules have led people to abandon pets, resulting in a large stray population that potentially causes more problems. Two years ago, Hanzhong in Shaanxi enraged animal lovers by announcing it had culled 36,000 stray and pet dogs. The Author of this Article was Tania Branigan in Beijing published by the The Guardian, Wed 3 Aug 2011 14.22 BST. Protection 4 Animals Supports The Protection of all Animals in all countries throughout the World. It is against the cruelty, torture and experiments on any Animals. It is also again China’s terrible Animal Welfare Policy as in this case the Killing of 30,000 Pet Dogs.